David Frum is senior editor at The Atlantic, former speechwriter for President George W. Bush and author of Trumpocracy: The Corruption of the American Republic. When doing things he shouldn't, Donald Trump is a hyperactive president. He blurts high secrets to Russian visitors. He fired the FBI director who investigated things Mr. Trump wished to hush up. Mr. Trump spreads disinformation, tweets abuse and hurls paper towels at Puerto Ricans like a dog owner dispensing treats. From the actual work of the American presidency, however, Mr. Trump's disengagement is extreme. To yoke these agencies to a common purpose, a complex group of co-ordinating agencies has been stacked atop them inside the Executive Office of the President. These agencies have been at best neglected – at worst sabotaged – by the Trump presidency. Let's start with America's most lethal domestic challenge: the fight against drug addiction. A terrible epidemic of overdoses killed some 63,600 people in 2016, up from an already horrifying 52,000 in 2015. The casualties for 2017 will prove higher still, according to preliminary government reports. A dozen federal agencies share the job of responding to this crisis, supporting the governments of 50 states plus the District of Columbia and Puerto Rico. Some agencies interdict drugs from abroad. Some regulate drugs manufactured at home. Some prosecute drug dealers. Some rehabilitate drug addicts. Some educate at-risk populations. Bringing order to this vast undertaking is the mission of the Office of National Drug Control Policy (ONDCP) within the White House. Although Mr. Trump campaigned hard on the opioid crisis, he did not get around even to nominating a director of the ONDCP until September. He then picked about as bad a choice as could be imagined: Tom Marino, a member of Congress who had led the fight to make it harder to police imports of suspicious pharmaceuticals, receiving hundreds of thousands of dollars of campaign contributions and lobbying expenditures from the industry along the way. What qualified Mr. Trump's choice for the job? He was the fifth member of Congress to endorse Mr. Trump during the 2016 campaign – and the first from the must-win state of Pennsylvania. The nomination quickly unravelled under withering criticism. Today, nearly a year into the Trump administration, the director's job at ONDCP remains vacant. Versions of that story can be told for almost every function of government in the Donald Trump years. The most important domestic-side function in the White House is the Office of Management and Budget. Mr. Trump appointed a hyperideological director, Mick Mulvaney. 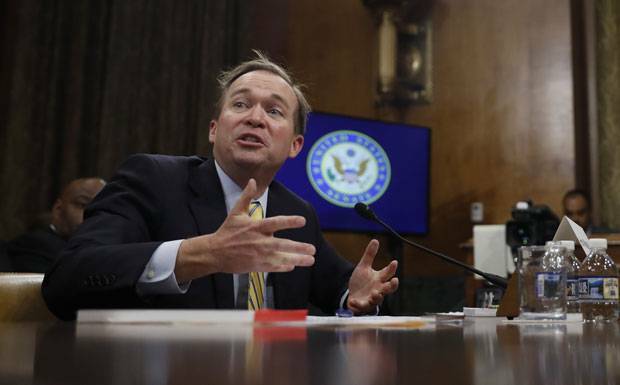 As a leading figure in the House Republican "freedom caucus," back in 2011 Mr. Mulvaney declared his willingness to force a default on U.S. government obligations in order to win a budget battle. That's already strange preparation for a budget chief. Maybe because Mr. Mulvaney is so distracted, the budget process – always a mess – has degenerated into near chaos in the Trump years. His administration still has not passed a budget for the fiscal year that commenced three months ago. Instead, the government has been funded by stopgap "continuing resolutions," premised on trillion-dollar deficits indefinitely – deficits, in times of comparative peace and prosperity, bigger than those the George W. Bush administration ran during the Iraq war or that the Obama administration ran during the worst economic crisis since the 1930s. Mr. Trump campaigned on "getting tough" on trade. He commenced his administration by withdrawing from negotiations for a new Trans-Pacific trade treaty. He has threatened to withdraw from the North American and U.S.-South Korean trade treaties, too, unless he gets better terms. Trade is shared across almost as many agencies as the drug-abuse portfolio. Treasury has a voice, for example, as does State. The co-ordinating agency here is the U.S. Trade Representative. This job Mr. Trump did fill (although there is still no head of either USTR's technology or agriculture office). Having named a reasonably plausible – although protectionist-inclined – trade lawyer as the trade representative, Mr. Trump then handicapped him by creating a second co-ordinating body, a "National Trade Council," and appointing as its head a protectionist polemicist with meagre professional qualifications: Peter Navarro. Mr. Navarro so alarmed the U.S. business community that in September, his office was joined to that of White House economic adviser Gary Cohn – effectively putting three people in charge of the trade portfolio, a practice even more destructive to policy-making than failing to name one. The results have been deeply threatening to world prosperity. Mr. Trump is hacking away at existing trade arrangements without even beginning to put anything in their place. Worse, the United States has been completely absent from the most important trade negotiation anywhere on Earth: the talks between Britain and the European Union on post-Brexit treaties. The Trump administration is contemplating war in the Korean peninsula: a 30-per-cent likelihood, according to South Carolina senator and born-again Trump ally Lindsay Graham. At the same time, it has repeatedly threatened a trade war against South Korea, the most important military partner against North Korea. Over the course of the year, Mr. Trump's NSC has become less bizarro. Mr. Bannon was removed from the principals committee, then from the White House – and has now spectacularly split with the President altogether. Trump's first national-security adviser, Michael Flynn, was forced to step down after 24 days, and has now pleaded guilty to lying to the FBI. Mr. Trump's first deputy national-security adviser – former Fox News talking head K.T. McFarland – who had last worked in government as a speechwriter and communications aide back in the 1980s – was demoted. More appropriate people have replaced them. The intelligence and military chiefs were added back onto the principals committee. Many of the weirdos and security risks who previously prowled the NSC corridors were removed, or at least lost security clearances. Yet even now, the system does not work. Every week, the United States' allies must make sense of some jarring new outburst. What security can South Korean and Japanese allies feel when Mr. Trump boasts of the size and strength of his "nuclear button" – indifferent to the fact that those two countries are already within range of a North Korean attack? Is the Iran deal still in place or not? Will the United States negotiate with North Korea without preconditions? On even these basic questions, there is no clear Trump administration policy (although the President has now clarified – or at least claimed – that his "nuclear button" is larger and more powerful than that of Kim Jong-un). The National Security Strategy released in December described Russia as a revisionist competitor to the United States; Mr. Trump, in his speech releasing the strategy, praised Russia as a partner. Nobody is able to impose order. Crucial jobs remain empty even now. There is no ambassador to Germany: The President's nominee, Richard Grenell, a famously vituperative blogger and television personality, is stalled in the Senate, likely because the Germans have communicated that he would be unwelcome in Berlin. For nearly a year, there was no ambassador to Spain, a country that could have used the help of its friends to soothe the national-unity crisis in Catalonia. Past ambassadors to the European Union have included such luminaries as Stuart Eizenstat (formerly President Carter's top domestic-policy adviser) and C. Boyden Gray (an eminent lawyer and close friend of George H.W. Bush). The post is currently vacant, because Mr. Trump's first choice was exposed as a serial fraudster, and the President hasn't gotten around to selecting another. Where the Trump presidency inherited a policy from its predecessors, it has sometimes been able to continue that policy to successful outcomes. Combat operations against Islamic State-held cities in Iraq started under Mr. Obama and have nearly reached their completion under Mr. Trump. But when it comes time to do something new, the administration is baffled. The capture of Islamic State territory has not put an end to the IS threat. The Islamic State will dematerialize into a terrorist network, recruiting online and striking inside other countries – as an IS-inspired Bangladeshi immigrant struck Times Square in New York last month. What then? Who's planning postconflict operations in Iraq and reconstruction in Syria? Who knows? If it cannot be done by the U.S. Department of Defence operating alone and unco-ordinated with other agencies or other countries, it probably will not be done at all. Mr. Trump subverts executive-branch institutions in order to aggrandize his own power. Maybe the most ominous of his attacks on these co-ordinating mechanisms is his drive to convert the Department of Justice and FBI into his own personal police force. Adrian Morrow explains the various Trump-Russia investigations and what they've done so far. Historically, the president oversees law enforcement, but he does not control it. He sets priorities: more or less attention to this or that area of federal jurisdiction. He does not direct the FBI to target or exempt this or that individual. If the president thinks a person has been treated unfairly, he has the pardon power – but of course, a pardon is a public act. What the president is never supposed to do is whisper quietly to the FBI, "This person is a friend of mine, please go easy on him; this person is an enemy, please arrest him." To protect the integrity of the law, the United States has evolved an elaborate system of rules and restrictions governing the relationship between the president, prosecutors and police. All communications between White House staff and the FBI are supposed to be routed through the White House counsel's office, and the White House counsel is usually a lawyer of high reputation. 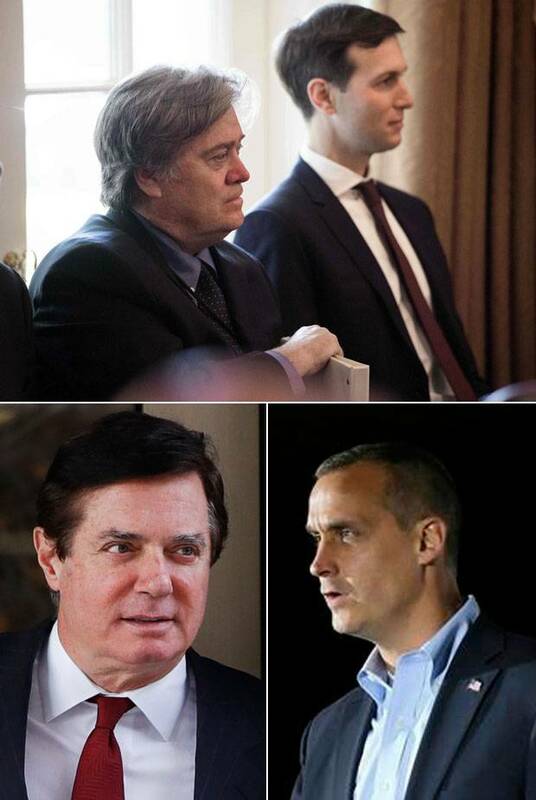 Mr. Trump, by contrast, chose as his White House counsel a combative partisan – who happened to be the nephew of the top lawyer for Mr. Trump's Atlantic City casino operations back in the 1980s. Mr. Trump's short-tenure communication director Anthony Scaramucci actually tried to order FBI investigations on his own authority. And Mr. Trump himself fired FBI director James Comey when Mr. Comey refused an order to shut down the investigation of Russian interference in the 2016 elections. 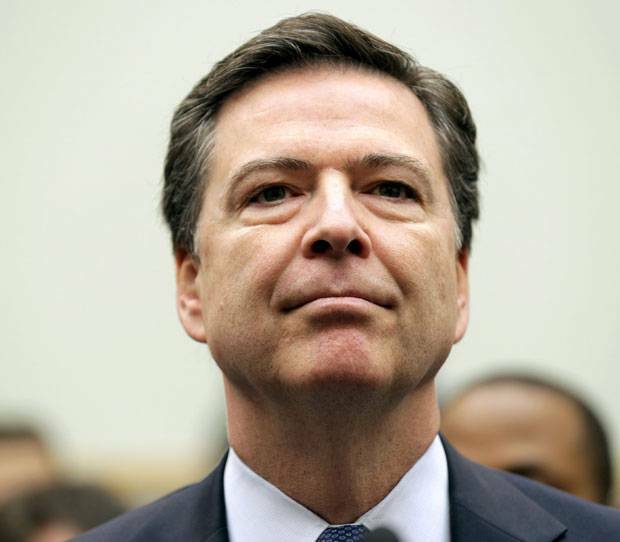 The last time a president fired an FBI director, back in 1993, it happened as a result of credible allegations of abuse of expense accounts – and after lengthy consultations with Congress. The claim that a president can fire a director who refuses to obey an order to stop an investigation is a shocking departure from a century of federal practice. Yet, suddenly, that very claim is being asserted by this White House, by Trump allies in Congress, and by pro-Trump talkers on TV. The whole system of fencing law enforcement from politics is under attack, and not by Mr. Trump alone. Richard Nixon famously warned, half a century ago, that the United States might dwindle into a "pitiful, helpless giant." 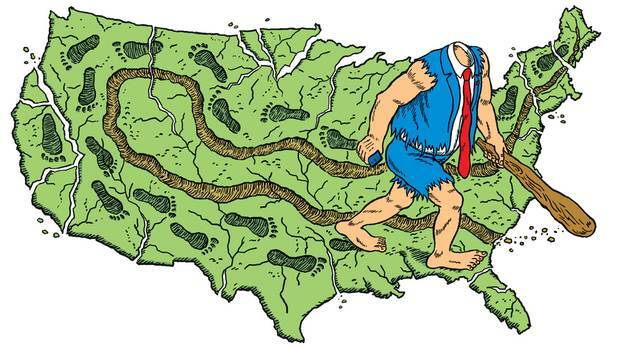 Under Mr. Trump, the U.S. government has been decapitated into a staggering, headless giant. 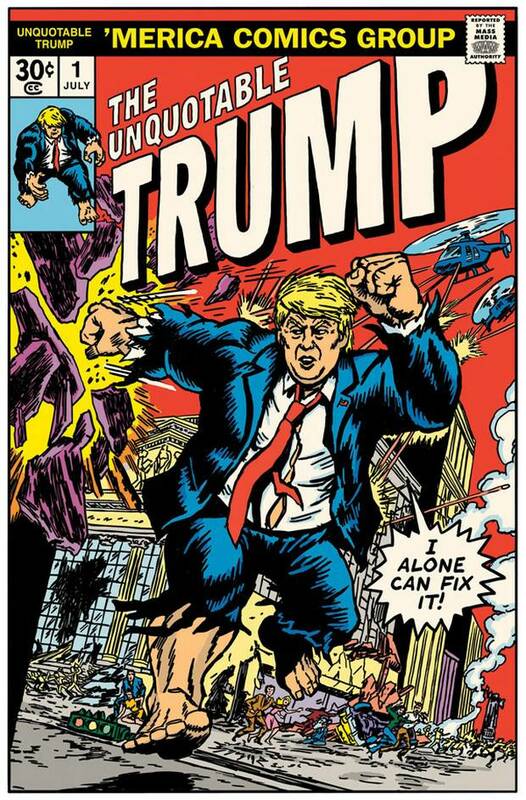 By design and by mistake – to cover for his wrongdoing and because of his own vast carelessness and indifference – Mr. Trump is sabotaging the institutions and agencies that protect the United States and sustain the peace of the world. The insider reports from Washington accurately portray a man unworthy of the presidency. However petty the man, his legacy for bad is huge and growing – not only for Americans, but for America's friends and partners worldwide. 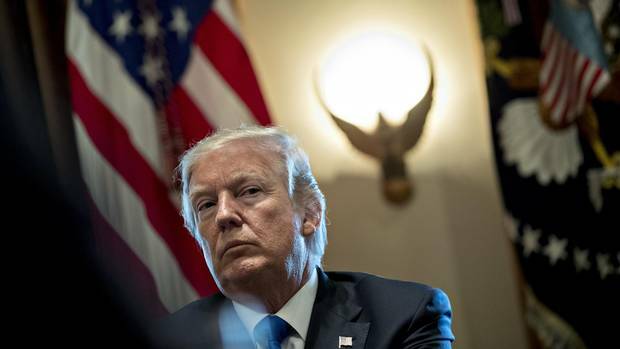 Review: David Frum’s Trumpocracy David Frum's book is a breathtaking compilation of the mendacity and mistakes of Donald Trump’s first year in office, and a warning that despotism doesn’t necessarily begin with violent disruption, David Shribman writes. 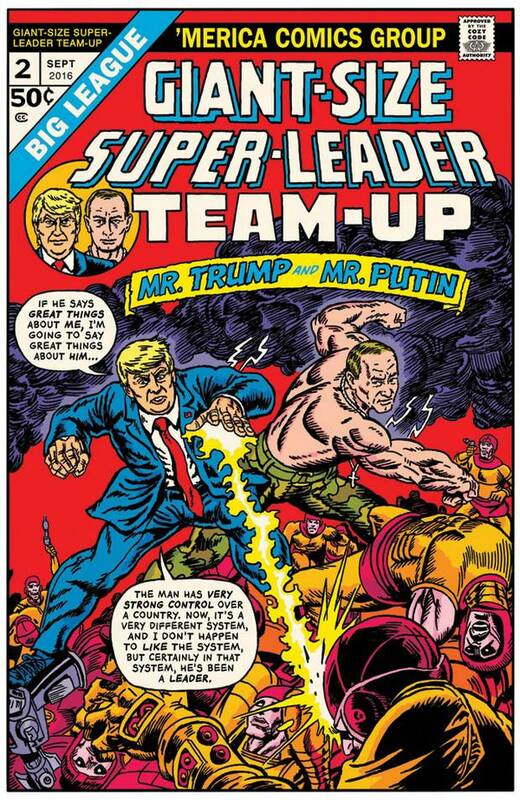 American cartoonist R. Sikoryak is the author of The Unquotable Trump, Terms and Conditions and Masterpiece Comics, all published by the Montreal-based Drawn & Quarterly. His comics and illustrations have appeared in the New Yorker, GQ, as well as on The Daily Show with Jon Stewart. The idea for The Unquotable Trump came to me in early November, 2016, just a few days before the election. I was so exhausted and distressed by Donald Trump's outrageous statements as a candidate that I wanted to say something. 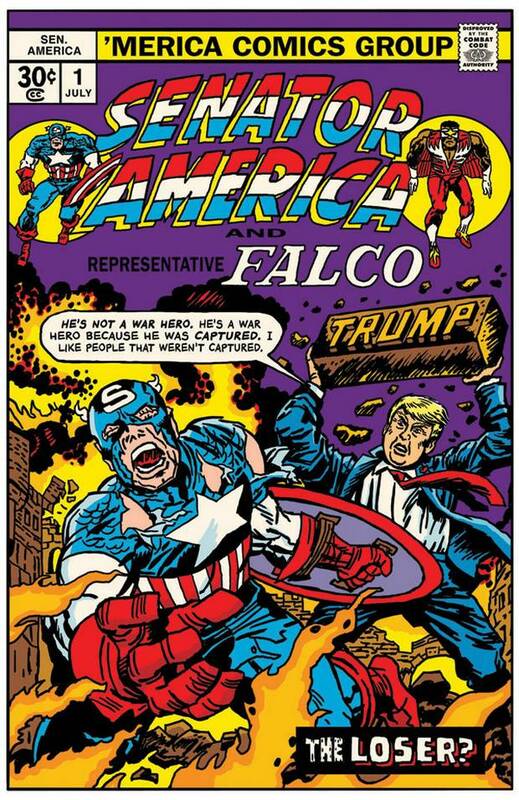 I thought it would be a perfect satirical response to take his actual quotes and put them into parodies of comic book covers, which are so bold and graphic. When he won the election, I felt I had to do it. When I posted the first images on Tumblr, the response was overwhelmingly positive, and my publisher, Drawn & Quarterly, approached me about expanding the concept into a book. I drew a total of 48 covers over the course of about 6 1/2 months. Comics can be very stark when depicting good and evil. 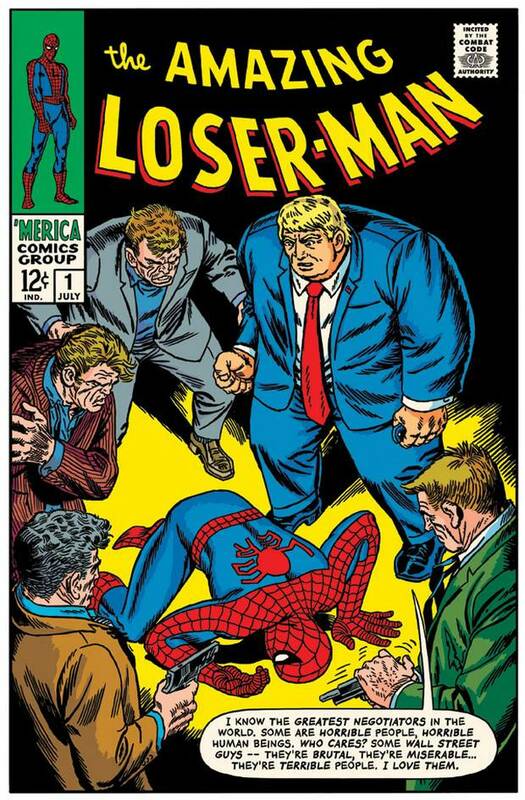 The medium is capable of being quite subtle and nuanced, but for this series, I'm definitely playing with the type of comics that employ stereotypes and a simplistic worldview, just like Mr. Trump's statements. It was important for me to only use Mr. Trump's real quotes; I didn't want to exaggerate or change what he said. 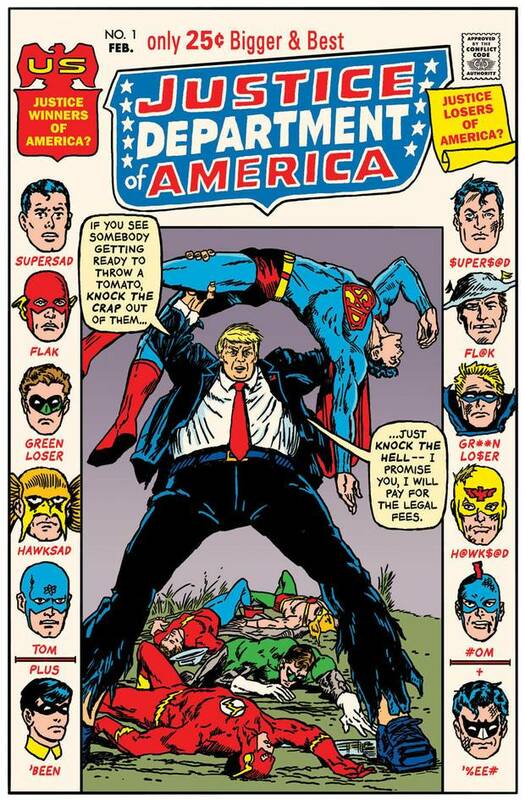 His over-the-top speeches are right at home on superhero covers. Also, I wanted to capture his rambling, spontaneous, colloquial way of speaking (rather than his Twitter voice) and play that off of the broad comic-book tropes. Most of the feedback I've received has been very positive. I actually expected I'd get more backlash, even from opponents of Mr. Trump, in that I'm giving him even more attention. I've read a little of that on Twitter, but I've seen Trump fans pick up the book and laugh at it as well. I'm not sure what to make of that. In my other comics, I try not to take an overt position, or to editorialize – but I thought in this case it's pretty clear where my sympathies lie! Many people have asked if I've heard from Mr. Trump, but I highly doubt that he will ever see it unless the right person talks about it on television, preferably on Fox News. 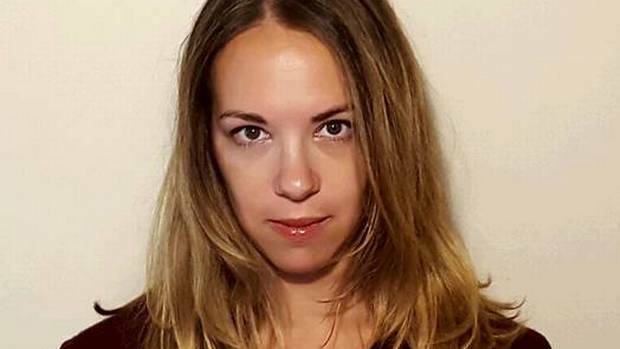 Sarah Kendzior: Trump is no genius, but he’s smart at playing dumb Do not be fooled by the president who cried Wolff: Odds are good that Donald Trump knows a lot more than he wants you to know, and Fire and Fury, while personally humiliating, is politically helpful. 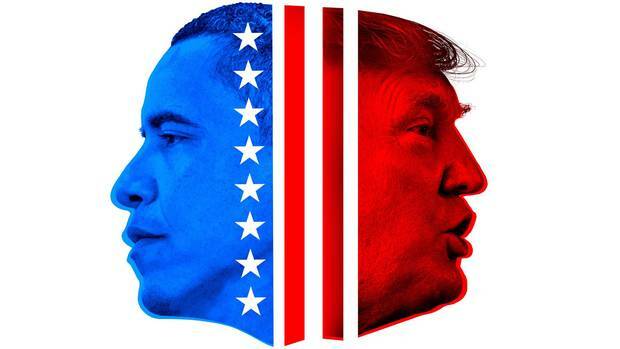 Omar El Akkad: Donald Trump and America’s new civil war Obama's presidency was supposed to mark a great leap forward for the United States. But, as Omar El Akkad discovered travelling across America last year, the election of Donald J. Trump has turned the country against itself. Chris Johns: Donald Trump’s diet is driven by fear. 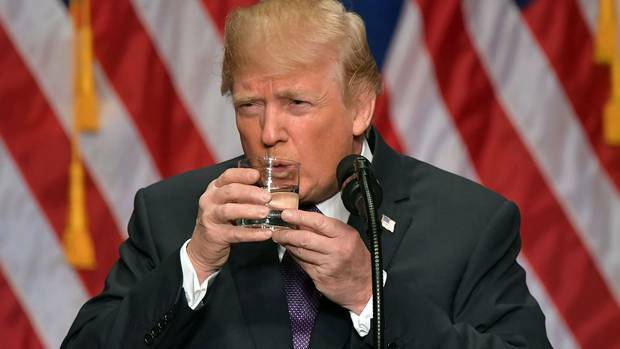 I tried it for a day A writer experiments with eating like the most powerful man in the world, and lives to regret it.